Who the Hell Puns in their Sleep?!?! I’ve not been sleeping well lately. More accurately, I’ve not been sleeping for long periods in the morning but I do have loads of REM sleep, complete with weird dreams. 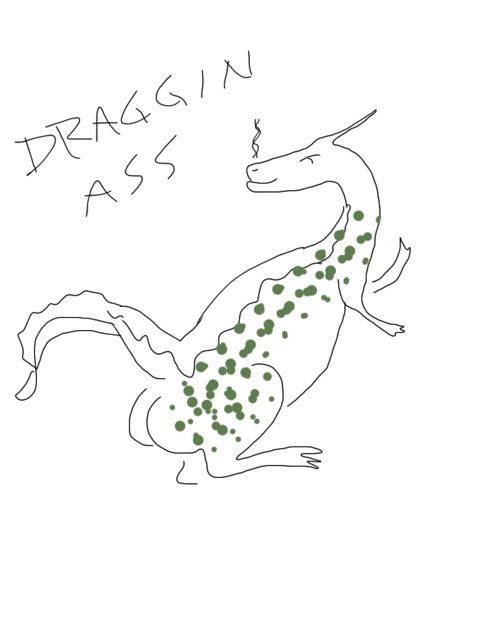 Last week I again dreamt that I was a man, and it was perfectly normal in the dream. Forget the details now, as you do, but I remember noting that I wasn’t even me in the dream. This morning, I was the interviewer for a TV documentary on a famous person. I wish it was someone real, but I don’t think it was. It was a man, and rather heavy-set and intelligent. I think he was an actor. Much like the amazing Stephen Fry, but it wasn’t him. I was there to document his unusual hobby, which was candle-making. In dream space, there was lots of time doing camera angles, set up, questions, etc. It went on for a while, perfectly normal – as if I have a clue what being a TV interviewer entails. I woke up immediately, laughing out loud. I am emotionally attached to my plants. Pre-script, written after but edited to go before the post: I’ve made myself snort a laugh about this post: I just told a friend it was hard to write because I hate to get ‘sappy.’ Get it? Its a plant-pun. Oh, leaf me alone, I like puns. 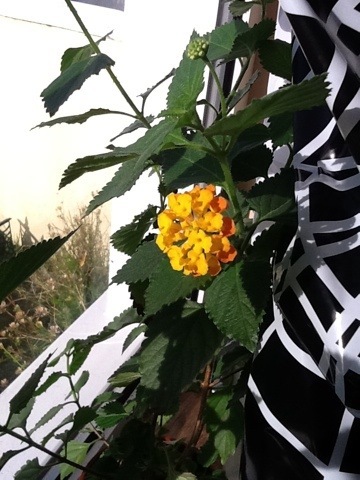 The pic is of one of my lantana bushes that I grew from seed this year. I am very much in love with the four that grew and thrived for me, and I don’t want them to die. I’m so worried that I brought them inside last month so the hurricane winds and rain wouldn’t kill them. I’m also afraid our winter this year will be harsh again, and I know these are semi-tropical plants. I also think they aren’t too pleased to be indoors, and I keep a close eye on them. I love my lantanas for two reasons. Firstly is because the house I grew up in, in NW Florida, had an empty lot next door that was full of native plants and scrub-brush. Prickly-pear cactus, strange fungi and mosses, wild rosemary, palmetto, pine trees, and lantana bushes. In retrospect, I actually did pay a lot of attention to the flora around me, but that’s probably because I was a very lonely and outdoorsy kind of kid. Anyhoo, the lantana were very close to our property, maybe even on it, as I was never sure where the boundary actually was. I never gave them much thought – they aren’t that pretty and the foliage has a strong smell – until fall arrived. In the autumn the Monarch butterflies would come through on their trek down to Mexico – not the great hordes you see in pictures, but enough that catching them with a butterfly net (ok, it was actually a little fishing net) was great fun and entertainment for hours. I’ve always loved the fall, and always will associate it with lantana: the unique smell it has, the pink and yellow flowers, and the delicate sipping tongues of the Monarchs. But I secretly wanted one. Last October, I got to go to visit my sister in South Carolina, to meet my only niece for the first time. I won’t go into great detail about the visit – it was a year ago and I was there for two weeks! I’d be here all day. Wish I had a blog then, though. Anyhow, one fine day we went to the beach, my little niece’s first ever visit. On the way back to the car I spotted a scraggly lantana, in seed, at the edge of the parking lot. So I gathered a few berries to bring home, not having any idea if, or how, they were meant to germinate. Double-special, these little plants! A reminder of one of the few good memories of childhood. A bit of home, when I am so very far away from all the places my memories were formed, and a physical memento of a great visit and a ‘baby’s first’. Hopefully, I will have these little green friends forever. Doesn’t look like much, does it? It’s a common Christmas cactus. But it is special, because it comes from my grandmother’s cactus, originally. Grammy died in… oh hell…I’m guessing 1976, 1977 at the latest. I was really young, so I don’t have a reference point to pin it down more accurately. Grammy was our mom’s mom, and Mom inherited the cactus when her mother died. The cactus lived outside (Florida, remember?) 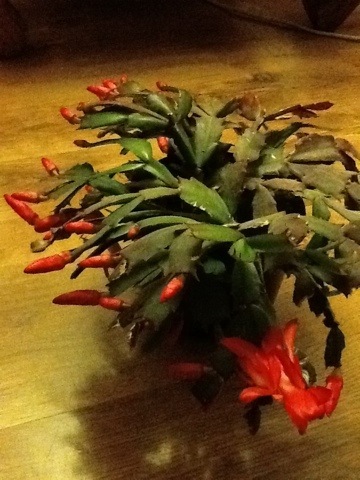 and it bloomed around Thanksgiving (end of November) rather than Christmas, so we called it the Thanksgiving Cactus. Although, as you can see, it blooms for Halloween in Ireland – and also in late April or May – an Easter-ween cactus? Fast forward to 1998, the last time I lived in Florida. When my mother died, I took a cutting from the Thanksgiving Cactus and started my own plant. Some cuttings survived and grew again, but very few. The one I was really worried about was the Thanksgiving cactus – and you can see, it is fine, happy and healthy. I have known this one plant for over 30 years. To me, this bit of beauty is more than a plant, it is a living gift from two beautiful women. I don’t have them anymore, but I do have a cactus that has grown and flowered for three generations of my family. Of course I love it.